While reading Richard Branson's biography Losing My Virginity, I came across an old lady. 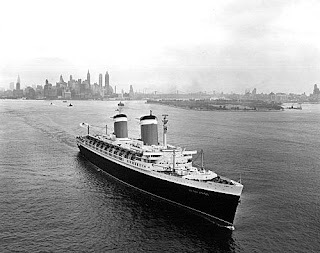 Her name is SS United States and she is the fastest ocean liner ever built. She truly was an impressive ship : she weighted 52,000 tons and needed 240,000 horsepower to shift her. The speed record she set was impressive : an average of 35.6 knots (40 miles/h). She was built in 1952 at the cost of $79 millions - not a cheap date! She won the Blue Ribband for the fastest transatlantic crossing. At 990 feet long, she's the largest ship ever built in the US. She now rests in Philadelphia. Publié par Unknown à l'adresse 3:05 p.m.